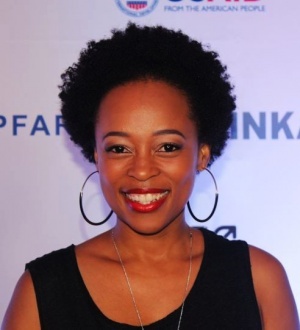 Mmabatho Montsho (born 19 October 1983) is a South African actress, visual artist, businesswoman, producer, director and filmmaker. She starred on Generations as Lumka Dlomo, on Rhythm City as Thembi Phakathi and as Lerato on M-Net's drama series Jacob's Cross. Mmabatho Montsho is a visual artist; in August 2018 she held her first solo exhibition titled "Manyano". Among those in attendance were Mmabatho Montsho's mother, father, brother and sister as well as boyfriend Mbuyiseni Ndlozi, EFF national chairperson Dali Mpofu and his wife Mpumi Nxumalo. The exhibition was hailed a success and the artwork exhibited was described as "compelling". Mmabatho Montsho received further praise for her choice of guests; particularly church women who sang soulful hymns when the exhibition started. The exhibition was held at the Women’s Jail at Constitution Hill. Mmabatho Montsho is in a relationship with Economic Freedom Fighters bigwig, Mbuyiseni Ndlozi. This page was last edited on 19 February 2019, at 21:25.